Just what the dead ordered or more than that I wonder? Take a few extreme Swedes and gather them under the same roof, what do you think you will get if not a meaty Death Metal grind machine? Well you don’t have to expect anymore because another Death Metal band was born, assimilating the powers of the old school along with the so called innovations of the present. The chosen name was OVERTORTURE and right after punching the play, letting the plague in, you will think to yourself: “Gee I think that I have heard something like that once”. Frankly, you won’t be far from the truth, but like in every band on this planet, there is always that spike, sometimes hidden, but to think of it, sometimes a bit obvious and even sickening. The latter occurrence is not in the case of our dear OVERTORTURE crew. Death dealing like their deadly comrades at arms of GRAVE, BLOODBATH and BOLT THROWER, these guys sport the dead; summon the zombies for a full scale venison bash on your sullen flesh with the debut “At The End The Dead Await”, via Apostasy Records, so be ready to be eaten and without the first course. 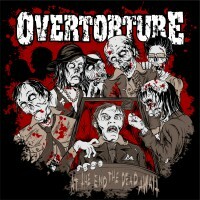 As I stated earlier, OVERTORTURE aren’t that different from the abyss created by other Death Metal bands of the early 90s and their own time. More than half of the band members themselves came from pretty known bands, both locally and worldwide, like GRAVE, COLDWORKER, DEMONICAL and DECADENCE, so therefore the slices of experience for you. What I mostly liked about “At The End The Dead Await” is the fact that under the modern shell of the sound, and rather well done engineering work by Ola Englund, OVERTORTURE felt old school, reeked of the sweet, conspiring and profound grip of the hoary Swedish guard. Thus their music isn’t only brutal with well played skin grinding riffing, guttural vocal jolts and spews, machined, part mid part face paced, drumming pumping Death and Thrash severe inflammations and stabbing bass, but also preserving the melodic end along with various soloing, yet in a much fiercer kind unlike the Gothenburg antics. No doubt that “At The End The Dead Await” created causes of interest with forlorn moments, as if flying over burning cities or waiting to be burned alive or eaten to death, damn what a rush. As a rhythm guitar fanatic, OVERTORTURE caught me with their mayhem like on “The Coming Doom”, a potential Death Metal relic for sure with a clear BOLT THROWER directive, “The Outer Limits” that felt like a mixture of Death / Black Metal with slender Thrash sections, somewhat in the vein of GOD DETHRONED, that I truly enjoyed and there is the death march or the picket line right before the feast with “At The End The Dead Await”, the final destroyer, mellow, crushing and foreboding right before the first bite. In general, I won’t hide my satisfaction out of this release. It might be shaped as contemporary contraption, but its bloody heart will show otherwise. On the other hand, there were a little than a few moments where I wanted to shoot myself as I was waiting for the next number to punch the clock. The band’s mellowness is soothing but not always, even the emphatic riffing stopped being that after listening to the same loops. At least the soloing on the weaker parts engulfed with their warm embrace. Even so, I suggest to head out to buy “At The End The Dead Await”, it will server your hunger well.